Yes, this is a REAL USPS postage stamp!!! Using the design for our 2016 Talent Tomato T-shirt, this stamp can be used for 49 cents of actual postage or as a souvenir. A true collector's item, this happy little tomato is sure to please anyone getting this special delivery stamp on their mail. Or, you can proudly display it in your home where it's sure to bring a smile. A unique and interesting way to honor our very own Talent Tomato!!! This captivating poster showcases 30 beautiful photographs featuring the front doors of some of Talent's most iconic and historic buildings. Bright and cheerful, the 24" x 30" poster includes views of pretty flowers, colorful blooming trees, and even a cat sitting comfortably in a front yard. Originally printed in 2008, photographer Clair Barr-Wilson and graphic designer Gail Bamber successfully capture the ambiance and grace of the City of Talent. 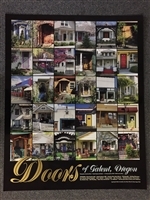 The Doors of Talent poster offers a glimpse into the small town charm that make our city such a pleasant place to call home, and it's sure to enrich your home as well. 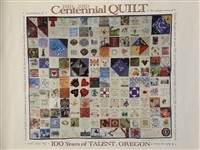 The gorgeous Centennial Quilt was a community project celebrating many of the diverse individuals, families, businesses and local history of the unique town of Talent, Oregon over the past 100+ years. Each square was lovingly crafted by folks that enrich our past and present and light our future. A wonderful tribute to all those that contributed to the Centennial Quilt project, this poster is a unique and attractive way to honor their efforts. It measures 24" x 18" and is suitable for framing. Car Magnet " I LOVE TALENT, OR"
What a great way to show your appreciation for our wonderful community. This 2 1/2" x 10" car magnet says it all!! Proclaim your love for Talent, OR in a fun and supportive way. Whether on the back of your car or hanging on the fridge, let the world know how you feel about Talent.